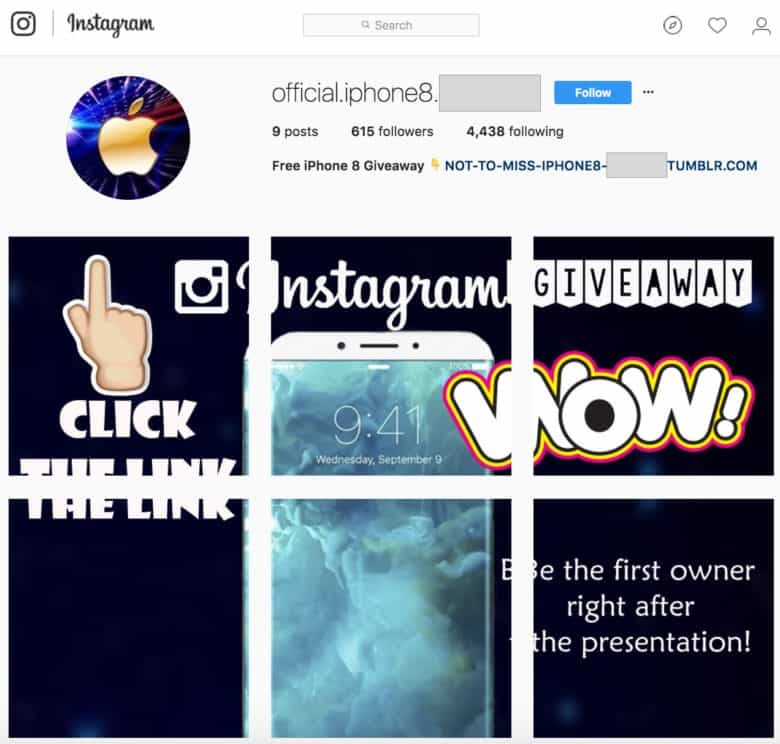 No, Apple won't give you a free iPhone for likes. iPhone 8 is now on sale and iPhone X is right around the corner, so every Apple fan wants to upgrade. Scammers are taking advantage of this by promising free handsets on social media sites like Facebook and Instagram, but believing what you read could prove dangerous. Apple’s newest smartphones aren’t cheap. iPhone 8 starts at a whopping $699, but you’ll be coughing up at least $999 if you want the swanky iPhone X. That’s a lot of dough, and unfortunately for many, it puts the new iPhone lineup out of reach. Social media pages promising a free model can look incredibly appealing, then. In most cases, they promise a brand new device in return for completing simple tasks, such as signing up to a website and inviting some friends. They sound too good to be true — and they are. ZeroFOX Research has identified over 530 fraudulent social accounts across platforms like Facebook, Instagram, Google+, and even YouTube. They all promise to “giveaway” the latest iPhone, and they’re all a complete scam. Some just want exposure using a practice called “fame farming.” They take advantage of your iPhone desperation by persuading you to like their page and invite others to do the same. Others are more malicious; they want personal information, including your address. Others ask you to complete surveys, and some will even direct you to links that phish for your login credentials to popular services, or offer up malware. Many of the pages use the Apple logo — or that of other popular brands — and use words like “official” in an effort to convince you of their authenticity. But they’re never verified with a blue checkmark, and they will never send you that free iPhone you were promised. ZeroFOX has a number of recommendations for identifying these scams. It says you should never trust accounts that impersonate big brands, or download and install apps they promote. Never give up personal information — especially to a site without a SSL or TSL certificate — and avoid following suspicious accounts. Keep your antivirus software up-to-date, and enable two-factor authentication on your social media accounts. This prevents anyone from logging in, even if they do get hold of your account credentials.